Presider: We gather at the table to share the compassionate presence of God, aware that “we are called to act with justice, to love tenderly, and to walk humbly with God”. All: The love of God loves through us as we comfort the troubled and confront injustices in the most practical and immediate ways. Being in Spirit with Jesus, we walk in his footsteps with pure and clean hearts and a willing Spirit. Let it be so. Amen. All (with an outstretched arm): May we reach deep within ourselves to hear Wisdom’s many messages, to faithfully understand them, and to respond to them with compassionate actions to our brothers and sisters. May we emulate the virtues of pardon and peace that Jesus taught us so that we may- in turn-be more forgiving in our care for ourselves, for one another and for our planet Earth. We ask this in the name of all that is. Amen. First Reading: Deuteronomy 4:1-2, 6-8 All: Thanks be to God. Second Reading: James 1:17-18, 21-22, 27 All: Thanks be to God. Gospel: Mark 7:1-8, 14-16, 21-23 All: Glory to you, O God. el: Mark 7:1-8, 14-16, 21-23 All: Glory to you, O God. This has been emotional week for me, as I am sure for many of you. We lost Aretha Franklin and Sen. John McCain, both heroes in their own unique ways. We also remembered and celebrated the anniversary of Dr. Martin Luther King, Jr’s “I Have a Dream” speech on August 28th. So, I wondered what these three people had in common? The answer for me: They all lived life with a “clean heart and willing Spirit” and exemplified the human spirit. Dr. King, like Jesus, was willing to die for what he believed in, and wanted all of us to share the same dream. He fought for racial equality, for justice and liberty for all, and he too paid the ultimate price. But, we know his legacy lives forever and his soul is eternal. We are all better people because of his life and his death and the vision of his dream. Aretha Franklin was born in 1942 in Memphis, Tennessee, the fourth of five children. Her parents separated by the time she was six, and four years later her mother succumbed to a heart attack. Her father was a Baptist preacher, and eventually landed at the New Bethel Baptist church in Detroit, where he gained national renown as a preacher. Aretha’s musical gifts became apparent at an early age. Largely self-taught, she was regarded as a child prodigy. She was a gifted pianist with a powerful voice and began singing gospel songs in front of her father’s congregation. By the age of 14, she had recorded some of her earliest tracks, and while on tour, she befriended gospel greats such as Mahalia Jackson and Sam Cooke. But life on the road exposed her to adult behavior and she was pregnant at the age of 14. A second child followed two years later. This could not have been easy. She continued with her gospel music and singing and began to be recognized and eventually was dubbed the “Queen of Soul”. In 1968 Franklin was enlisted to perform at the funeral of Dr. Martin Luther King, Jr., where she sang her heartfelt rendition of “Precious Lord”. My two favorite quotes by Aretha are, “We all require and want respect, man or woman, black or white. It’s our basic human right,” and “The milk of kindness flows through my body, I shall follow Jesus to the Taco Bell and give thanks.” Rest in peace our beloved Aretha Franklin. I think that Aretha Franklin, Sen. John McCain, and Dr. Martin Luther King, Jr., are examples of living with a pure heart and a willing spirit, and I am so grateful to them; for their courage, their speaking truth to power, and their actions. They were not perfect. None of us are. Jesus was not perfect. But, he was perfectly human. These dear ones we remember today were perfectly human and their “best selves” are what we remember and honor. We are a better America because they were here. We are a better world because they lived. We believe in Jesus of Nazareth, the human Jesus, an enlightened soul who carried the message of God’s Word, who showed us how to heal ourselves and others, and the heart of God’s compassion. He is the bright star in the firmament of God’s prophets, mystics, and saints. And it is through him that we become a new people with a different story of salvation. We are here to share his stories of the new message, that we are all holy, we were born holy, and we shall be holy forevermore. She strengthens our call to follow Jesus as a vehicle of God’s love, and is the one who helps us reach within ourselves to heal and energize us when our spirits may grow weary in our lives. Presider: That those who have gone ahead of us -- especially, Sen. Joe McCain and Aretha Franklin, who dwell forever in our heavenly home, we pray. R.
Voice 2: Gracious God, you have set the banquet table and have invited all of us to the feast of unending delight. Here we celebrate your divine love beyond what all words can describe. Your divine compassion connects us to the young and the old, the least and the last, to everyone, everywhere, on our journey into the heart of your mercy. Voice 3: We thank you, Holy Mystery, for the gift of Jesus of Nazareth in history –and the gift of Jesus in faith. You brought him from among your people to baptize us in your Spirit. His life was moved by his vision of your presence in himself and in his mission, and he recognized you in everyone he met. He showed us, through his example, not only how we should live, but also what was worth dying for. Voice 4: And when his time on earth had come, to a close, Jesus – aware of and accepting his destiny – gave up his life for the values that he deeply believed, lived and taught…his conviction that love is stronger than death. And then, in providing an example of this wisdom for all people in the ages to come, he opened wide his arms…and died. And the Spirit that lived in Jesus is resurrected in all of us who live the new story. Jesus is with us today as he will be through the end of time. “Get ready my soul I’m divin in. To the deepest kind of love. To the sweetest kind of life. 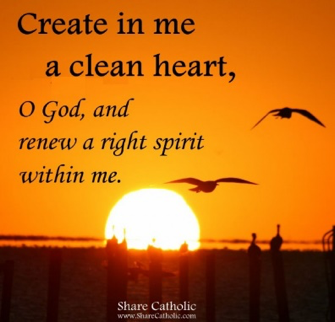 May we continually remain clean of heart and willing in Spirit. And may we be the face of God to the world, reflecting a compassionate and caring presence in us to everyone we meet. All (extend an arm in mutual blessing): May our gracious God, bless us all gathered here, in the name of God our Creator, in the name of Jesus our Liberator, and in the name of the Holy Spirit, our Sanctifier as we minister in love to one another and to all those we meet on our journey. Be with us as we continue on our path and follow in the footsteps of Jesus -- for we are the face of God to the world. Amen. Presiders: May we all go in the peace of Christ and our caring love for one another. Let our service continue!